Community meeting held in the Roma community of Merisani by a local health worker about the importance of vaccination against measles. The Toolkit on social participation, developed by the WHO Collaborating Centre on Social Inclusion and Health in 2016 and published by WHO/Europe, was recently translated into Romanian. Thanks to this translation, it is informing a new project to improve the health status of Roma communities in the country. Empowering people in order to promote health and health equity is one of the priority areas of the Health 2020 policy framework for the WHO European Region. To do so, it is important to focus on participation processes which involve the whole of society, with special attention to vulnerable groups such as the Roma population. The Toolkit provides policy-makers, project managers, professionals and nongovernmental organizations with methods and techniques to promote social participation in the design, implementation, monitoring and evaluation of projects aimed at improving the health of the population. The Romanian-language Toolkit will disseminate examples and case studies of successful strategies for promoting social inclusion to policy-makers and stakeholders concerned with ensuring the health and well-being of Roma people. 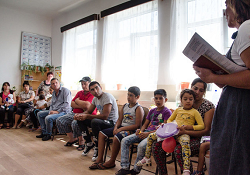 The Toolkit is included as a strategic tool for the project developed by the National Institute of Public Health in Romania to promote community care among Roma people. The initiative will build on the successful implementation of the previous project “Strengthening the National Network of Roma Health Mediators to Improve the Health Status of Roma Population”, which contributed to shaping a new model of practice for community care that aims to improve Roma access to the services. “The WHO Toolkit on social participation, recently translated into Romanian, will represent a valid tool that is going to be added to the instruments to be used in current community care practice,” stated Adriana Galan from the National Centre for Health Status Evaluation and Health Promotion of the National Institute of Public Health, and Project Manager of the initiative.